Following the season of mince pie annihilation comes the inevitable rush to the gym and your local workout spot can go from a peaceful, muscle-tuning haven to a sprawling mass of sweaty bodies. This year, avoid the mounds of gurning beefcake and get ripped in your humble abode instead. Specifically, with a home gym, sometimes known as a multi-gym. If we're talking about a good blend of build quality and budget, it is very difficult to ignore the Marcy Eclipse HG3000, but the absolute best, without spending absolutely stupid money, is the recently updated Life Fitness G7. It costs a packet but this really is gym-quality machinery for the home, with dual weight stacks, some 20 pulley adjustments per column and a chin-up/pull-up bar covering every muscle group and fitness base imaginably. Admittedly, you'll need a Bruce Wayne-sized man-cave to house this thing but it will be all you'll ever need to tone, sculpt and hone that dream bod. Multi-gyms cover a number of muscle-sculpting bases, with numerous levers, handles and pulley things used to tone and bulk up. As a result, they tend to take up a fair amount of room. They are also heavy, difficult to set-up and can err on the really bloody expensive side, but for those with the space, patience and budget, they can literally be all you need to obtain that dream body. Part with upwards of £10k and you will receive a multi-gym that wouldn't look out of place in a professional establishment... but that's just silly. A still-very-good compact home multi-gym (the kind that works both upper and lower body) can be found from around £600 at entry-but-not-rubbish level to more complex and sturdier versions at about £1,500. The main considerations you must make is how much space you have to spare at home, how much time you have to assemble the thing, how heavy you need the weight stack to be in order to achieve your fitness goals and how many different muscle groups you want the machine to cater for. The best multi-gyms will offer everything from a lateral pull down to a weighted leg press and pretty much all in between, negating the need to visit a dank and sweaty gym ever again. Bonus. One way to ensure you receive a gym-quality workout is to purchase the sort of equipment that resides in your local fitness centre and slap it in a spare room at home. The Life Fitness G7 multi-gym is a professional-grade setup for private use, featuring hefty dual weight stacks, fully adjustable twin pulleys and the option of a malleable bench that hits several incline and decline settings. 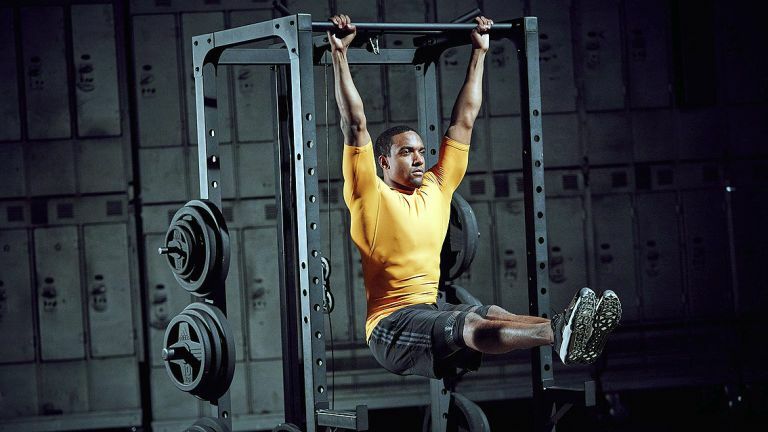 Throw in the chin-up bar and you have an all-encompassing system that has the ability to workout almost every conceivable muscle group in the body. To do so, it measures over two-metres tall, around two-metres wide and the same depth, which is quite a lot of floor space to take up. It's not cheap either. However, the US-built contraption is designed and constructed to last for many years and that hefty initial outlay does include free installation, a training DVD with two workout routines, an exercise book with over 60 exercises and a bunch of pulley attachments to ensure you hit every muscle that counts. Also, it removes the need to workout near people. Money well spent, then. The first thing you notice about the robust Marcy Eclipse is the excellent build quality for the price, with the provided tensile aircraft cables (able to withstand up to 2000lb of pressure) offering peace of mind to anyone worried about the machine falling apart mid-rep. This quality is carried through to the padded seat, comfortable foam leg rollers and cool black and red paint job that make it look a little bit like the hot hatch of the multi-gym market. The unit also comes complete with a number of attachments that allow for numerous exercises to be performed back-to-back with little adjustment or mid-session faff. For example, the free-floating arm levers can be used to perform a seated bench press and pectoral fly, or tucked away and the overhead high pulley used for triceps push-downs and wide lat pull-downs. And if you don't know what any of the above meant, there's a handy exercise chart located above the weight stack for reference. Granted, that 68kg weight stack may restrict progression once the guns really start popping and will likely be too feeble for a number of leg-based exercises, but it is a solid all-rounder nonetheless. This rig might look like some sort of Elizabethan torture device but it is, in fact, an extremely handy tool for those who like to hit more traditional workouts and build solid bulk. Designed for functional strength training, the rig caters for bodyweight-based pull-ups and dips, as well as resistance exercises via the lat pull down bar, straight bar, dual foam padded hand grips and ankle strap. There are also numerous height adjustable bars for help when squatting big mass and racks for assisting with heavy curls. While the rig does come with six weight plate storage bars with Olympic plate attachments and spring collars, you will have to purchase the actual weight plates separately, which could get expensive. However at least it means you can get exactly the weight spread you want. You'll also want to invest in a decent barbell to make the most of the squat rack and safety rods, as well as a decent bench for upper body exercises. Just as well the rig itself is relatively affordable, then. Rather than relying on a heavy and noisy weight stack, this clever home gym utilises a bespoke Bowflex Power Rod system that sees a pulley mechanism flex a series of metal rods. The thicker the rod, the higher the resistance and this puppy can deliver the equivalent resistance of a 95kg weight stack without the jerky inertia or risk of joint pain usually associated with free weights. However, the Bowflex technology doesn't limit the spread of exercises on offer, with numerous attachments and harnesses allowing for a number of motions to be carried out. New to the system is an abdominal crunch shoulder harness, which allows the user to physically wear a harness that loads up the resistance for powerful six-pack toning. Other notable features include the three-position lower pulley and squat station that can be used to carry out natural feeling squats for mega glutes, hamstrings and quad muscles. Better still, the Bowflex Power Rod system can be upgraded to offer more resistance, with the equivalent of 185kg rods available for around £90, although installing these things can be fiddly and time consuming. Also, those used to a classic, thumping and clunking weight stack will likely find the 'feel' of this system a little weedy, but if simply shaping up as opposed to bulking up, is your priority, it could be right for you. Although not as robust as some of the other machines on this list, the mouthful that is the BH Fitness Multi Gym Plus Titanium Foldable does save a lot of space at home with its uniquely retractable seat. Featuring a smooth, linear bearing system and ultra-tough pulleys, this 92kg multi-gym can handle users that weigh over 20 stone, it provides up to 67kg of resistance and offers up a multitude of exercise options. Unfortunately, some of the ancillaries feel a bit cheap and the comparatively low resistance weight stack won't be able to compete with some of the chunkier models but as a starting platform to any burgeoning home gym, it's well worth a look. If money is no object then the Unica from Technogym is well worth a look, as it straddles a fine line between home fitness equipment and piece of contemporary art. With leather pads and the imposing metallic structure available in a number of hues, it practically oozes class, while the ergonomically designed system of levers allow for over 25 exercises to be performed in just 1.5 square meters of space. All materials used are of exquisite quality, with chrome plating covering many of the levers and handles and a thermosetting powder coating finish to the frame setting off the fussily stylish aesthetic. And so it should, because with a price tag of around 5K, although those muscles might come easy, they won't come cheap. If the thought of gigantic, heavy metal machinery is enough to have toes (rather than biceps) curling, then take a look at this basic but perfectly okay multi-gym. With just 29kg on tap, it's not for serious iron pumpers, but it makes a great entry into the world of weight training, with enough small incremental increases to ensure development is slow but steady. Naturally, the frame is going to feel a lot less robust than others on this list but that's not such a bad thing. It'll be easier to set up, for one, and its lack of mass means it's not likely to come crashing through the ceiling during particularly vigorous workouts.